With 400 hours of video being uploaded to YouTube every minute, we know how hard it is to be seen. What if we told you that one platform could boost your numbers like never before? You will be using the same platform that Eminem, Akon, Gucci Mane, Young Buck, Sony, Disney, Universal, Ted Talk, L’Oréal and 40,000+ other marketers have been using to make it big. We’re talking millions of subscribers and views shooting higher than a skyscraper. Here’s the secret: Promolta is a self-serving advertising platform that has a colossal publisher network. These publishers show your videos in over 10,000 trusted blogs, game apps, websites and social networks. There are plenty of uncanny bots out there that unethically boost views on your video without interacting with it. Since video views are not coming from a real person, botting will give you the lowest engagement rates, causing your video to be eventually demonetised. 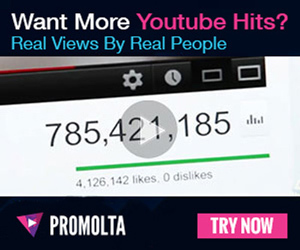 With Promolta, your videos are shown for a minimum of 60 seconds to real people. If your video is not seen for 60 seconds, it’s considered free and you don’t have to pay for the view. Since your videos are watched for a long duration, you can be sure that your views come from real people and not bots, giving you a great engagement rate. When people see ads, they tend to ignore it or even block the advertiser out of frustration. Worst case scenario, your ad could be banned. When your videos are displayed non-forcefully, viewers genuinely like your content and share it with their network. This viral sharing is the key that gets you really noticed. Promolta displays your videos non-intrusively on publisher networks. This entices people to watch the video because of its relevancy. The native placement of ads naturally grabs attention and gets more social shares than any other platform can. Promotions may require you to shell out a huge budget. And many times, the results might not even be close to what you had hoped for. There are many intricacies involved in setting up promotions that require hiring an expert. Well, the good news is, you don’t need anyone’s help. For as little as $10 you can promote your video through Promolta and get enormous results or you can reach for the stars with a big budget. Advertisers get up to 100x views beyond their budget by investing in Promolta. Analytics is most important to improve your future YouTube videos. It helps you understand which one of your videos are performing well and which ones are downers. There are specific metrics to track, statistics to study and multiple sources to gather resources from to accurately measure your success rate which can be quite challenging. With Promolta, reading your analytics report is easy as pie. You can track the daily progress of your video and the exposure it gets with one click. Monitor everything from video views, likes, comments, subscribers or app installations. Eminem’s music video ‘Rap God’ is one of the many videos promoted by Promolta that made use of analytics to improve its reach. Whether you’re an established YouTuber or if you’re just starting out, Promolta can help push your videos to a whole new level. And all you have to do is sit back and watch the numbers grow. Have any queries? Promolta has a skilled support team that prioritises customer satisfaction. If you’re not tech savvy, have trouble with payments or want to know more about the type of promotion that will best suit your needs, Promolta has a solution for it all.